I admire the camouflage of this snake. Look at the brown band which runs through the eye. The iridescent sheen of the scales is probably due to the fact that this individual recently moulted. Hitherto we have recorded nine species of snakes at Dokmai Garden in Chiang Mai in northern Thailand. In all of Sweden, which is almost the same size as Thailand, there are only three species. The ninth species was caught yesterday: the banded kukri snake (Oligodon fasciolatus, Colubrinae). The genus is not fully resolved so this is a tentative name. I have seen this small snake a couple of times in the Orchid Ark nursery, always moving so quickly I thought it was a skink. For the past two days I have cursed the chicken for overturning pots, but today I saw that the culprit is a snake. 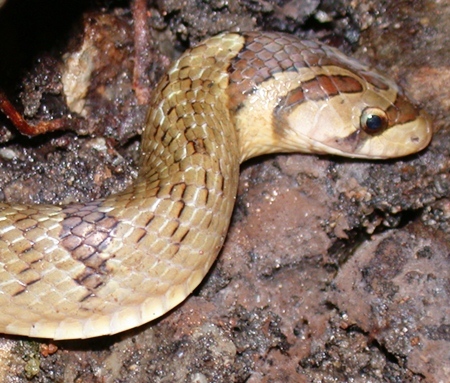 This common snake is characterized by a round pupil and an olive back with brown military camouflage markings on the head. Some scales have a black margin, some have a white margin. Although not venomous, it has sharp slashing teeth adapted to a diet of bird and reptile eggs, in addition to grubs and other large insects. These teeth may inflict a deep wound which may become infected. Although I am sure this snake controls many pests, we can not risk having an accident while moving around pots with bare hands. Khun Densak, Dokmai Garden’s fearless head gardener, caught this fast snake using a stick, and then he twisted it around the stick and released it outside Dokmai Garden. Simond’s mute orchid, Cleisostoma simondii. The orchid genus Cleisostoma literally means ‘closed mouth’ in latinized Greek. The flowers of Cleisostoma look like many other small brownish orchids, but this genus is identified by its tumour-like ‘callus’ blocking the mouth to the spur. The genus Cleisostoma was coined by the German botanist Carl Ludwig von Blume in 1825. He spent nearly ten years in Java where he part of the time directed the Bogor botanical gardens. In 1829 he became the director of Rijksherbarium in Leiden. The orchid genus Cleisostoma contains over 100 species found in Southeast Asia and Australia. So who was Simond after which this orchid (Cleisostoma simondii, Orchidaceae) is named? He was a field collector for the French botanist Francois Gagnepain (1866-1952) who first described this orchid species. Gagnepain spent many years in Southeast Asia, mainly in Vietnam. Simond’s mute orchid has been found from Nepal and India to Southeast Asia including Thailand. It is native to Chiang Mai, and just began displaying its unusually large flowers (for being a Cleisostoma) at Dokmai Garden. How do you recognize it from other Cleisostoma? The size of the pink and greenish brown flowers, 1.5 cm, is striking. The lip is triangular and pink, and the spur’s sides are decorated with veins. The orchid plant has erect and terete (cylindrical) leaves, while many other Cleisostoma have leaves hanging down. It prefers evergreen forests but is usually well exposed to the sun. We do not consider this species acutely endangered since it is fairly common here in the north and is widespread in many countries, but it is still a member of the Orchid Ark. www.dokmaigarden.co.th. [email protected]. The Zingiber ottensii is also known as the purple ginger root and has a light yellow flower. One problem with vernacular names is that they are not exact. Going to Chiang Mai’s Khamtieng flower market I thought I would just pick up ordinary ginger (Zingiber officinale) and plant it at Dokmai Garden. Sure, I asked for the Thai name ‘king’ and I got it swiftly. Well, now my ‘king’ is in blossom, and it is another species: Zingiber ottensii! This has not happened once or twice, but maybe 60 times. You ask for one plant, the dealer or farmer gives you something else. Sometimes they do this because they do not care about being exact, similar is good enough. Sometimes they do it because they do not know much, or because a name in one part of the country refers to one plant, but in another part it refers to a completely different plant. Never identify a plant based on a dictionary, never trust the vendor – use a flora! Most members of the ginger genus, Zingiber, form their flowers in a separate conelike inflorescence. Zingiber is also characterised by a swelling of the leaf base. Kai Larsen lists 48 species of Zingiber native to Thailand. The flowers of Z. ottensii can only be admired early in the mornings, as they wilt in the afternoon. Next day there will be a new set of flowers. At Dokmai Garden we grow this plant in the shade where it makes flowers and leaves. It is native to moist evergreen forests of Thailand, Malaysia and Indonesia. Its rhizome is purplish and so quite different from true ginger. I therefore propose the English name ‘purple ginger root’. Ginger (Zingiber officinale), spice, red and yellow flower on green cone, turning red. 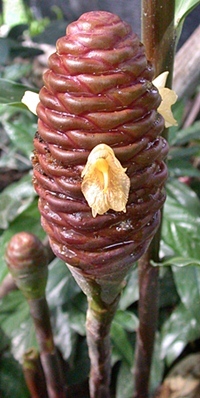 Purple ginger root (Zingiber ottensii), spice, light yellow flower on brownish red cone.